High profile Aussie films are doing well in 2017, with Lion and now Jasper Jones occupying prominent positions in the local box office. 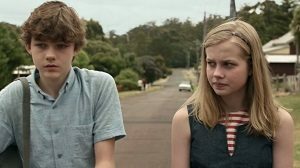 Based on the popular novel of the same name, which has featured on school syllabuses for a while now (and which I haven’t read), it tells the story of Charlie Bucktin (Levi Miller), Eliza Wishart (Angourie Rice) and Jasper himself, played by Aaron L. McGrath. Living in a small Australian country town in the 60s, their lives are drawn together when one of the townsfolk goes missing. Within the first ten minutes, I could see why the book turned out to be so popular. An incredible opening couple of scenes have you hooked from the get-go. If you want an example of how to capture your audience’s attention within moments, then you couldn’t find much better than this. Aside from a single instance of gratuitous narration that never returns, director Rachel Perkins’ film oozes confidence. The cinematography is brilliant, the score is strong if ever-so-slightly over the top, whilst the performances impress. The film relies heavily on nostalgia, and feels 5000% Australian. Racism and sexism lurk around the edges of the interpersonal drama, though there isn’t anything particularly nuanced about the depiction. It’s enough to spark dialogue amongst Year 7 students, however. Toni Collette, Hugo Weaving, Dan Wyllie and Matt Nable round out the adult cast, whilst Miller is great as the central protagonist. Rice, of course, acts the pants off everyone around her, including the adults…but after These Final Hours and The Nice Guys, we already knew this. Kevin Long is another stand-out as Jeffrey Lu (though his name is mysteriously missing from the cast list on IMDb). McGrath is good enough as Jasper, though the script doesn’t afford him the same opportunities it does Charlie and Eliza. And herein lies my central issue with the film. The eponymous character barely features. It’s one thing to include an Aboriginal supporting character, but it’s another to name the story after him, despite the startling lack of depth afforded to his story. Jasper Jones may be the title of the film, but we’re almost in (500) Days of Summer territory here – he’s there to set Charlie on his path. His continued absence through much of the running time didn’t feel right at all. Despite this, Jasper Jones is a beautifully made film. The mystery at its heart is compelling, the production values are wonderful and the pacing is perfect. Unless someone can tell me that this differs drastically from the source material, my only complaints presumably stem from the novel itself. This entry was posted in Film Reviews and tagged Drama, Mystery, Period Drama, Thriller by Stuart Wilson. Bookmark the permalink.